Grand River Dam Authority linemen at work on a portion of the Authority’s electric distribution service in the MidAmerica Industrial Park near Pryor. 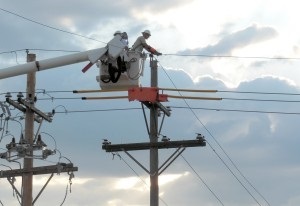 GRDA’s low electric rates for industrial, municipal and electric cooperative customers across Oklahoma were key reasons why the Authority received credit rating upgrades last week. Vinita – When the Grand River Dam Authority goes forward with its bond issue, totaling approximately $320 million next month, it will do so with improved credit ratings. Last week, both Moody’s Investors Services and Standard & Poor’s Ratings Services issued upgrades and new outlooks on GRDA’s ratings. For GRDA, it is action that comes at a very important time, just before the issuance of new debt. Another rating agency, Fitch, also improved its outlook on GRDA bonds last week. Higher credit ratings can equal lower interest rates, Sullivan added, and they will also enable GRDA to save money on natural gas hedging in the future. “That is very important as we moved towards construction of the new GRDA Unit 3,” said Sullivan. Construction of that facility – a combined cycle natural gas generation plant – will be funded with proceeds from the October bond issue. On Tuesday (September 16) Moody’s announced it was raising GRDA’s from A2 to A1, with a stable outlook. The agency based its findings on several key factors including GRDA’s improved financial outlook and low rates. According to Moody’s, GRDA’s electric rates consistently rank among the lowest in Oklahoma while also ranking in the lowest 20 percent nationwide. Earlier this year, S&P had revised GRDA’s outlook, based on the previous “A” rating, from stable to positive. However, this latest action is the first rating upgrade GRDA has received from the agency since it moved GRDA to the “A” in 2008. Both the S&P and Moody’s upgrades are historic and represent the highest credit ratings GRDA has ever received. Following those upgrades, Fitch announced on Friday (September 19) that it was affirming the “A” rating it had given to GRDA in 2008. The agency is also moving GRDA’s outlook from “stable” to “positive”. While GRDA will use the majority of the proceeds from this bond issue to construct the new gas plant, other proceeds will be used to complete emissions control upgrades on Unit 2. That unit is one of two existing coal fired generators at the Grand River Energy Center (east of Chouteau). 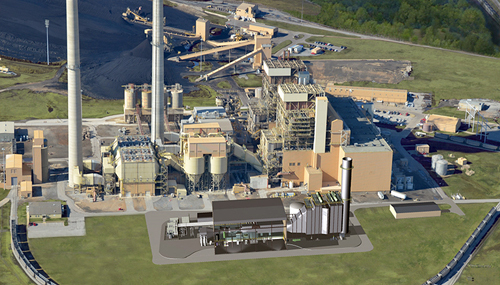 An artist’s rendering of the new GRDA Unit 3, combined with an aerial photo of the existing Grand River Energy Center (east of Chouteau, Oklahoma). Proceeds from a bond issue, scheduled for later this fall, will be used to construct the combined cycle gas plant, which will be powered by Oklahoma natural gas. At its August meeting, the GRDA Board approved several items related to the coming bond issue. Vinita – The Grand River Dam Authority took another major step towards the realization of its long-term generation plan last week when its board of directors approved much of the preliminary steps needed for a $450 million bond issue, which will likely take place later this fall. 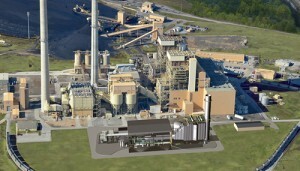 GRDA will use the majority of the proceeds from this bond issue to construct a new, combined-cycle gas fired generation plant at the Grand River Energy Center (formerly Coal Fired Complex). Other proceeds will be used to complete emissions control upgrades on Unit 2, one of the existing coal fired generators at the facility. A combined cycle unit produces electricity in two ways: natural gas is first used to fuel a combustion turbine-generator and then heat from that process will be recaptured and used to produce steam to turn another steam turbine-generator. The new unit, designed by Mitsubishi Hitachi Power Systems Americas, will be powered by Oklahoma natural gas and will be the first of its kind in the western hemisphere. Once complete, it will have the potential to be the most efficient combined cycle unit in the United States. At its August meeting, the board approved the necessary resolutions related to the bond issue, which included the preliminary official statement and bond purchase agreement. GRDA expects the issue to take place in October. Historically, the Authority’s bonds are very popular in Oklahoma. Prior to August 2012, when GRDA paid off $200 million in bonds, Oklahoma residents in 76 of 77 counties held a combined $272 million worth of GRDA bonds. A $550 million GRDA bond issue in 2008 was, at the time, the state’s largest, in terms of retail sales to in-state investors. In March 2013, Moody’s Investor Services affirmed its “A2” rating for GRDA and moved its outlook from “stable” to “positive” status. In April 2014, Standard and Poor’s Rating Service took similar action; reaffirming GRDA’s “A” rating and moving the outlook from stable to positive. According to Sullivan, these revisions can mean lower interest rates when bonds are issued; something that will benefit GRDA’s ratepayers. Higher ratings can also enable GRDA to save money on natural gas hedging in the future. All three rating agencies: Moody’s, S&P and Fitch will update their GRDA ratings prior to the bond issue later this year. Headquartered in Vinita, GRDA is Oklahoma’s state-owned electric utility; fully funded by revenues from electric and water sales instead of taxes. Directly or indirectly, GRDA’s low-cost, reliable; electricity serves nearly 500,000 homes in Oklahoma and stretches into 75 of 77 counties in the state. At no cost to Oklahoma taxpayers, GRDA also manages 70,000 surface acres of lakes in the state, including Grand Lake, Lake Hudson and the W.R. Holway Reservoir. Today, GRDA’s 500 employees continue to produce the same “power for progress” that has benefited the state for 75 years. In early August, this license requires GRDA to begin lowering the elevation of Grand Lake to meet a 741’ mark by September 1 to complete a millet seeding project around the newly-exposed mudflat areas of the lake. The lake is then held at this elevation until mid-October, when GRDA is required to begin raising the elevation to 742’ by month’s end. The license then calls for the lake to be held at 742’ through the winter and spring months, before GRDA begins raising it to meet a 744’ mark on June 1. It is then held at this elevation again, until August 1. This annual lake drawdown is mandated by FERC under the terms of GRDA’s hydroelectric license to operate Pensacola Dam. Although the millet seeding is not taking place this year (and has not since 2011) FERC still requires the drawdown. In both 2012 and 2013, GRDA asked for a variance from the rule curve to suspend the drawdown. FERC did grant the variance in 2012, but not in 2013. The City of Miami has indicated to FERC that suspending the drawdown might increase the risk of flooding in the community. GRDA continues to seek a long term solution that will balance the interest and concerns of all lake users while also giving the organization greater operational control of Pensacola Dam. The graph illustrates the elevation requirements and schedule mandated by GRDA’s operating license for Pensacola Dam/ Grand Lake, as issued by FERC.